Summary: Gwendolyn "Dough" X doesn't think she has much going for her—she carries a few extra pounds, her family struggles with their small bakery in a town full of millionaires, and the other kids at her New Jersey high school don't seem to know that she exists. Thank the stars for her longtime boyfriend, Philip P. Wishman—or "Wish." He moved away to California three years ago, when they were 13, but then professed his love for her via e-mail, and he's been her long-distance BF ever since. At the beginning of her junior year, though, Wish e-mails that he's moving back to Jersey. Great, right? Well, except that Dough has gained about 70 pounds since the last time Wish saw her, while Wish—according to his Facebook photos—has morphed into a blonde god. Convinced that she'll be headed for Dumpsville the minute Wish lays eyes on her, Dough delays their meeting as long as she possibly can. But when she sees Wish at school, something amazing happens. He looks at Dough like she's just as gorgeous as he is. But Wish is acting a little weird, obsessed with the sun and freaked out by rain. And the creepy new guy working at the bakery, Christian, is convinced that there's more to Wish's good looks than just healthy eating and lots of sun. He tells Dough that a mark on Wish's neck marks him as a member of the Luminati—an ancient cult of astrologers who can manipulate the stars to improve their lives. Is Wish and Dough's love meant to be—or are they star-crossed? Our review: I enjoyed Balog's first two novels, Fairy Tale and Sleepless. I have mixed feelings over her third, Starstruck. Gwendolyn, or "Dough" as she's called, works at her mother's bakery, has a younger sister, Evie, and along with their divorced mom live above their business on the island of Cellar Bay. When the story begins Dough has learned her childhood bestie, Wish (who moved away with his mother when his parents split up) is returning to the mainland to be with his dad. Shocked and unprepared to see him, especially after she's seen his latest pics on Facebook, Dough laments about her weight and how he will perceive her when he sees her again. Still, she wonders how did he get so incredibly hot? Maybe his time living in California is to blame for his godlike transformation? Dough has a likeable personality. She's witty and intelligent and, in case you didn't hear, fat. I thought she spent too much time obsessing over her body at times and when it wasn't her excess of curves, she was worrying about Wish breaking up with her. What I really wanted to see was something else happen within the first eighty or so pages. When school begins and the new kid Christian takes over her morning shift at the bake shop, we get some insight into an interesting character. Yet Christian doesn't fully flesh out until towards the end. He is the one to alert Dough that there's something going on with her boyfriend and then it still takes a while for her to agree. I found the storyline, though sweet, not engrossing enough for more mature YA readers. Dough's preoccupation about her body did become cliche and tired halfway through. Did she have to be so hard on herself? As for the mystery surrounding Wish and a group called the Illuminati, this angle had a certain cool factor going for it in a market saturated with supernatural beings. I wanted to read more about Wish's interactions and not just from Christian's point-of-view. The ending came across as rushed and predictable. 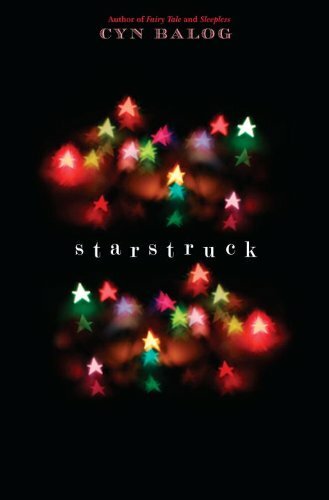 Overall, Starstruck is a great summer vacation book: a quick, sweet story with just the right touch of love and otherworldly wonder to make it enjoyable. Favorite excerpt: "It reminds me that I am forgetting to breathe. I take in the salty sea air and exhale slowly as a seagull screeches. Wish's body stirs and he springs upright, looking around. His back is to me, so I don't think he notices me, but he runs his hands through his hair, visibly shaking and tense, more agitated than I've ever seen him. He grabs handfuls of sand and throws it everywhere as a string of curses, horrible, vicious words I've never heard Sweet Wish use before, spew from his mouth. He breathes once or twice, then settles back down again. Silent. Dead. Cover comment: Dark and cute but the stars do come across as being too holiday-ish for me. Hmm, good review. It's too bad the book didn't wow you, but it sounds like it still had its merits. Thanks for the write-up!